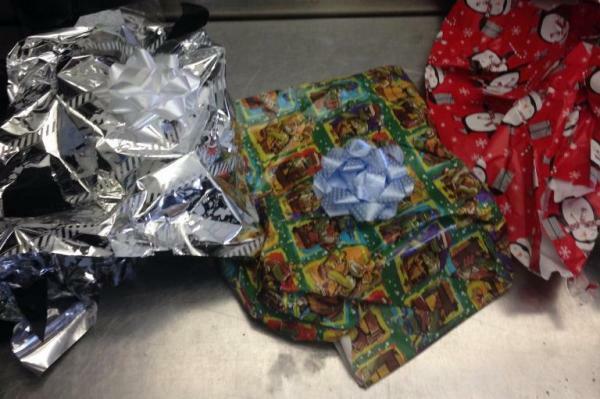 LOS ANGELES, Dec. 23 (UPI) — Prosecutors said a Los Angeles man is facing charges after trying to fly out of the city with six packages of suspected heroin disguised in Christmas wrapping paper. The U.S. Attorney’s Office for the Central District of California said James Mitchell, 25, attempted to fly out of Los Angeles International Airport Dec. 10 on a Frontier Airlines flight to Cincinnati, Ohio, but Transportation Security Administration staff conducted on “image scan” on his checked bag that discovered “an unknown dense material” in the luggage. The TSA found “six packages of a suspicious gray brittle concrete-like substance” disguised using Christmas wrapping paper inside the luggage. A “vinegar odor” coming from one of the packages led to a Hazardous Materials Unit closing down a portion of Terminal 3 while they worked to ensure the packages did not pose a public health risk. The substance inside the vinegar-scented package tested positive for heroin. Investigators said there was about 2.15 pounds of the drug inside the package. Mitchell, apparently aware of his bag being discovered, fled the area and told a Frontier employee who reached him by phone that he was in a restroom and not feeling well. Security cameras at the airport revealed he fled the terminal on foot after removing his hat and changing his sweater. Mitchell was arrested Monday at his home. Prosecutors said they discovered Mitchell is an employee of Aero Port Services at LAX, which gives him access to secure areas of the airport. The U.S. Attorney’s Office said the other five packages are undergoing testing to confirm the presence of heroin. The substances inside the six packages weigh about 11 pounds total, investigators said.